Buy Green City Blackeyed Beans 500 grams in the UK from our online shop or directly from our independent Scottish store. We sell a wide variety of Beans & Pulses including products like Blackeyed Beans - 500g. This vegan recipe is full of flavour and all the family can enjoy it, it's a deliciously hearty and healthy veggie curry that tastes delicious and is simple to make and packed with protein. This recipe contains 1 cup of black eye beans (can or cooked). As official Green City stockist, we sell genuine Beans & Pulses directly from our shop in Scotland and online throughout the UK. Where can you buy real Blackeyed Beans - 500g safely online? If you are wondering where you can buy Green City Blackeyed Beans 500 grams safely online in the UK, then shop with us. We are an actual health foods shop; with real people selling real foods and products. Our award-winning independent shop is located in Stirling, Scotland since 1976. You can buy our Wholefoods and other genuine Beans & Pulses in store or safely place an order with us online or over the phone. 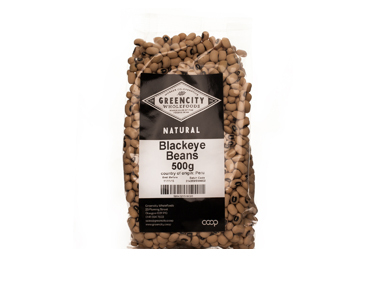 Blackeyed Beans - 500g - Green City Blackeyed Beans 500 grams in Beans & Pulses and Foods.